Bern rooftops and the Alps in the distance from the roof of Bern’s main station (from my Bern flickr photos – click on any of the photos to enlarge). 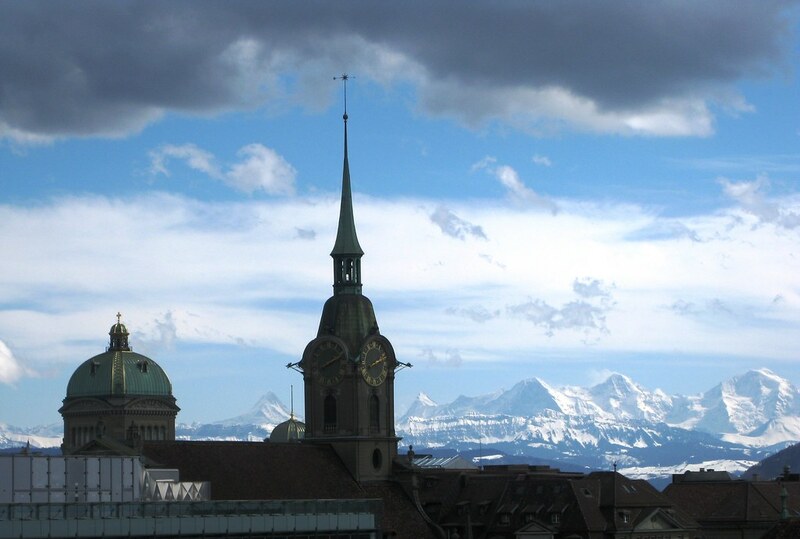 We traveled to Bern often when we lived in Switzerland and recently visited to attend a conference. Here are some recommendations. 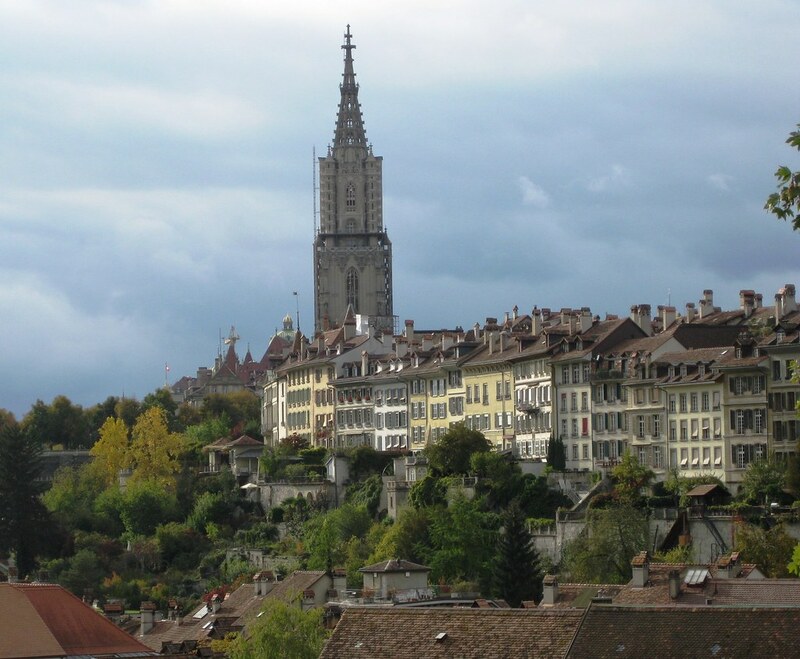 Bern is Switzerland’s capitol and is less than an hour from Zurich by train. The train is a great way to travel: it’s faster than driving and you can see exactly how Switzerland’s “taktfahrplan” system works (it’s a timed transfer system where all trains arrive in stations a few minutes before the hour – then passengers transfer between trains – then the trains all leave a few minutes after the hour). 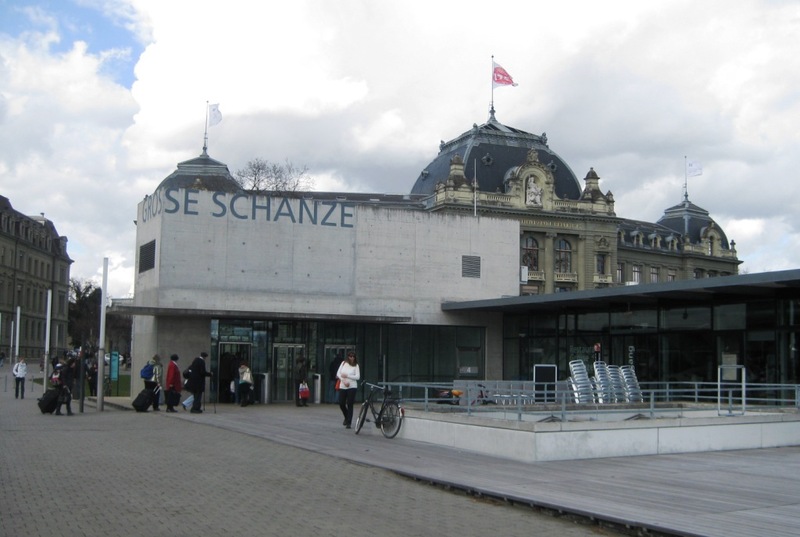 Here’s some information on transport in Zurich and Switzerland from my website. Bern Cathederal and center city (shot near the Barengraben). The Zurich – Bern route is especially interesting because to make the one-hour “takt” work, the SBB had to build a high speed section of track on the route. Now the non-stop trains take about 57 minutes – the high speed section was designed exactly to fit the one-hour takt. If you take the train, look around: there is a non-stop train every half hour and several local trains – and they are almost all full. The Swiss rail system is a great example of how creating an integrated network of high quality public transportation can get people out of their cars. But, back to Bern. 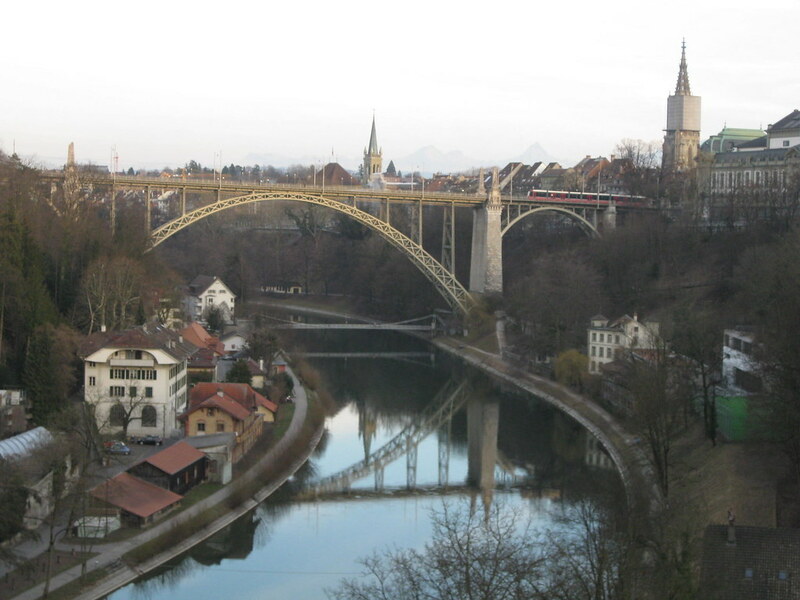 Kornhaus Bridge in Bern (note the tram on the bridge and the Alps faintly in the background). Bern’s main train station is in the center of town. Like most Swiss rail stations Bern’s is very busy. It’s filled with stores (which, due to a special law, are open late and on Sundays – in contrast to most stores in Switzerland). From the main concourse you have two choices: go towards the city center or towards the parking garage. Surprise! First, go in the direction of the parking garage. A set of elevators will take you past the parking floors to the fourth floor: the elevators open onto a huge park called the Grosse Schanze in front Bern University’s main building. This photo shows elevator building, cafe and university building (unobstructed view). In the other direction is a view over the city and if it’s clear you’ll be able to see the Alps in the distance (see top photo). There is a restaurant here which is pretty good, it’s actually a cafeteria for the SBB workers, but Swiss cafeterias can be quite good. The historic center of Bern is a UNESCO world heritage site. Much of it was built during the middle ages and it’s filled with brightly painted fountains and cobblestone streets. The most noticeable feature are the arcades: there are continuous arcades on many of the central streets. The first level of these buildings is filled with stores, restaurants and cafes. There is a farmers market on Saturday in front of the Swiss Parliament and extending down some of the adjacent streets. 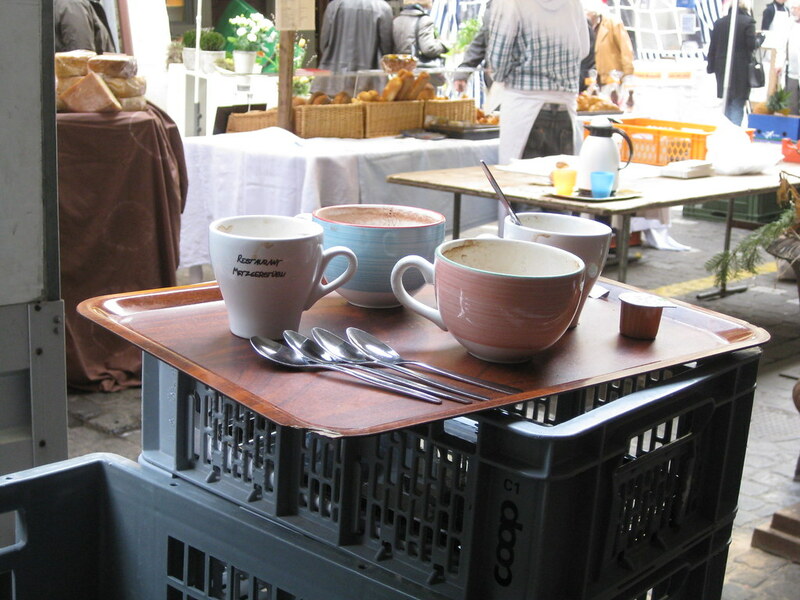 The photo is behind the scenes at the market: coffee to go. The center of Bern is a wonderful place to wander around. One of the highlights in Bern is the Zentrum Paul Klee. Klee grew up in Bern, became a teacher at the famous Bauhaus school in Germany, and then moved back to Bern. A large collection of Klee paintings was donated to the city on the condition that they build a museum for it. The Zentrum Paul Klee museum, designed by Renzo Piano, is a beautiful building with an undulating grass covered roof. The site overlooks the city and is easily reached by the #12 bus from the main train station (the museum is at the end of the line and so the buses say “Zentrum Paul Klee” on the front). The museum can be crowded so plan accordingly. Also note that if you are coming on the train to Bern you can buy a combination ticket for the round-trip train ride, the local bus and the museum from your originating train station. Just ask for a “RailAway” ticket for the Zentrum Paul Klee. Also note that RailAway (English) has lots of great rail ticket combination offers. These not only save you money, but also reduce the hassle of figuring out how to buy tickets and use local public transport systems (although using public transport is not difficult in Switzerland). 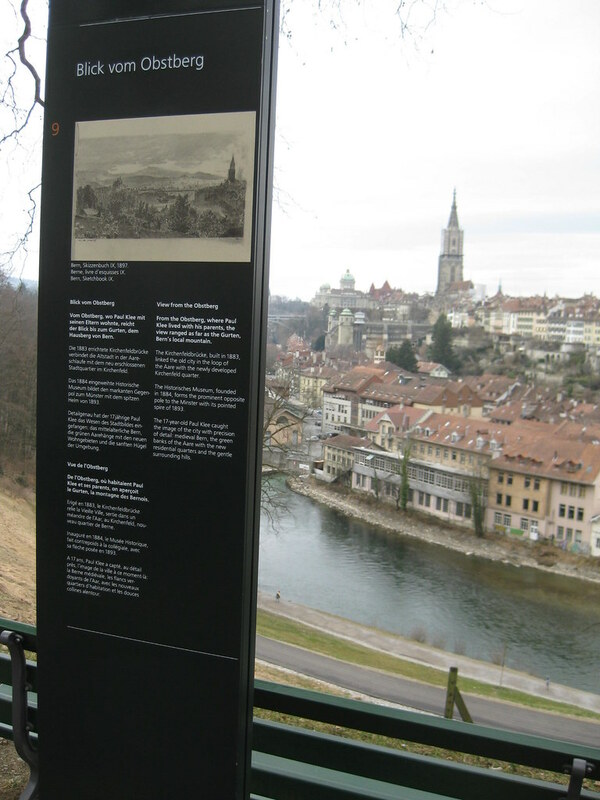 You can also walk to the museum, the city has recently created several “trails” through Bern connected with Paul Klee. The trails also take you to other Bern sights and have signs describing the connection with Klee. The sign at the right has a drawing Klee made when he was growing up showing the same perspective of the city as you can see. We have three restaurant recommendations, although there are plenty of great places to eat in Bern. The first is the Altes Tram Depot, a modern microbrewery built into, well, an old tram depot. 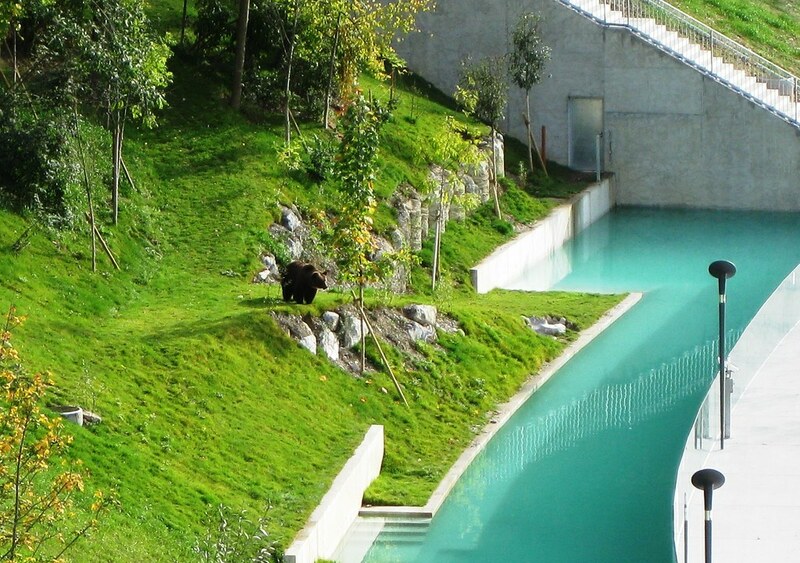 It’s directly adjacent to the Barengraben: an open-air cage for bears (Bern’s city symbol is the bear, you’ll see bear images a lot in Bern). Right in front of the tram depot is the old bear pit, just looking at it makes you feel sorry for the bears kept there; but on the side is the newly completed bear area: a large expanse on the banks of the Aare River with its own river water. It’s a huge improvement and another popular tourist site. The Altes Tram Depot restaurant has traditional Swiss and “beer hall” food not to mention excellent beer. We have eaten here many times and it’s always been good. 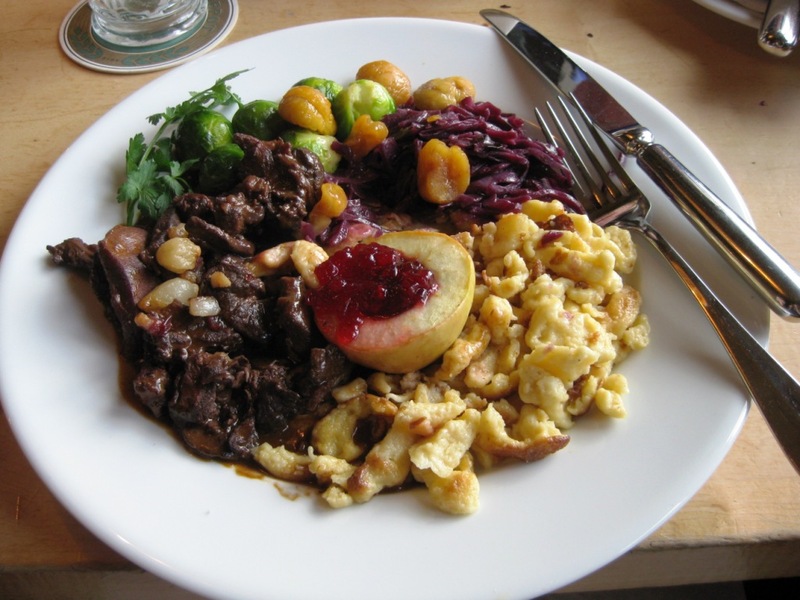 Last time I had their wild (venison) shown in the photo, and our friends had Zurich geschnitzels (veal in cream sauce), Munich Weisswurst and spatzele – everything was tasty and high quality. It’s a busy restaurant but service is quite good although it can get loud (after all it’s a beer hall!). They have a wonderful terrace/ beer garden overlooking the Aare and historic center, it’s a great place to have a beer and enjoy the view. (It’s also on the #12 bus line to the Paul Klee Zentrum – bus stop: Barengraben). On our last trip we had dinner in a wonderful restaurant called Brasserie Bollwerk (2015 – unfortunately gone!). It overlooks the railway viaduct that leads into the Bern main station, so there’s lots of trains going by (especially just before the hour and just after the hour, have you been paying attention?). They also have a nice terrace for outdoor dining, although it’s on a busy corner so there is lots of automobile traffic. The restaurant is a member of Slow Food Switzerland and so much of the food is local and organic – they are also non-smoking! 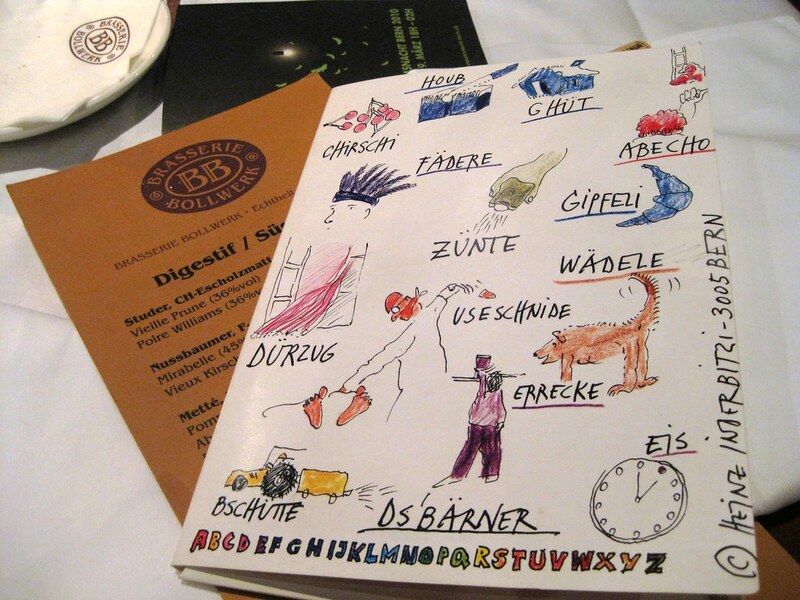 They have drawings from a local artist, the photo shows a set of postcards to help explain the local Bern dialect of German. 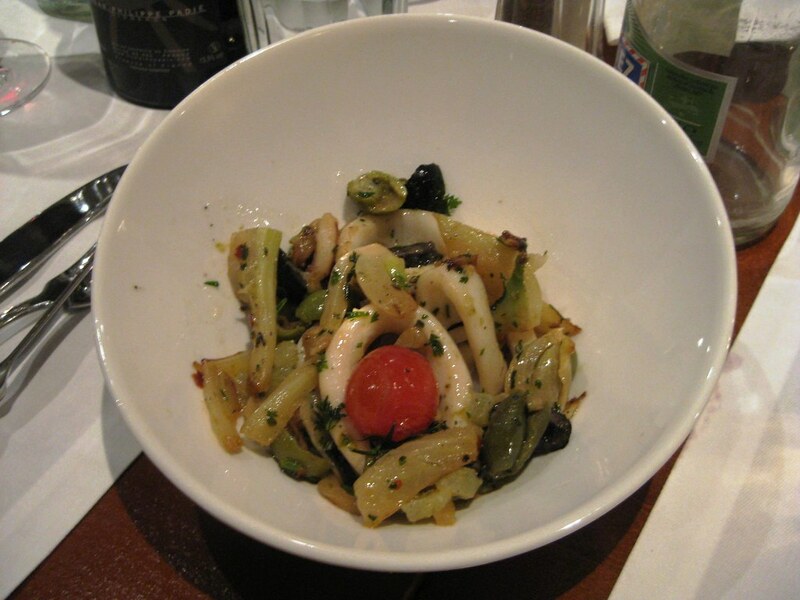 We started with a calamari and fennel dish (shown in the photo), then the special of the evening, a wonderful roast lamb (perfectly cooked) with potatoes and vegetables. Dessert was a really find chocolate mousse. They also had a wonderful Côtes du Roussillon wine that went perfectly with the food. The staff at Brasserie Bollwerk were friendly and efficient. They are open for lunch and dinner during the week. Note that across the street in the ground floor of the rail station is the SBB Heritage Foundation library (SBB Historic Foundation – German). 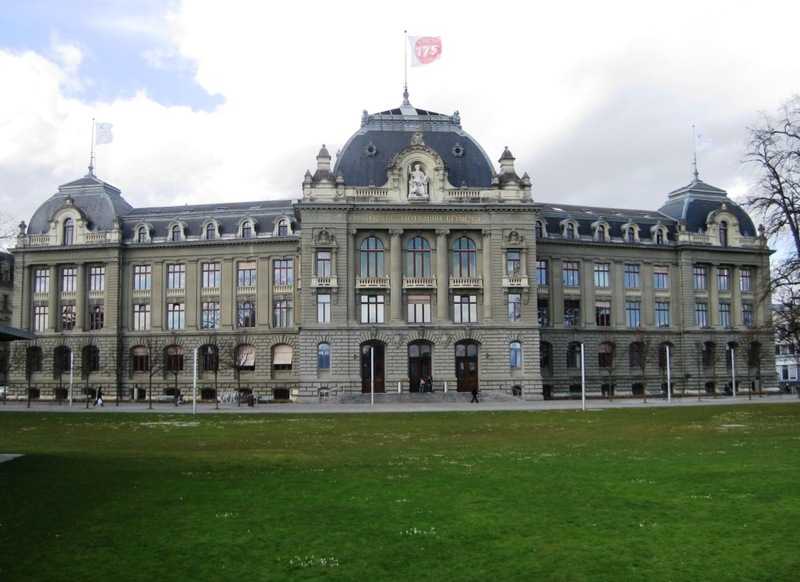 This is not a museum, but the historic archives of the Swiss National Railway. They often have small exhibits in the lobby area. They are only open certain hours, and you need to ring the bell to visit. 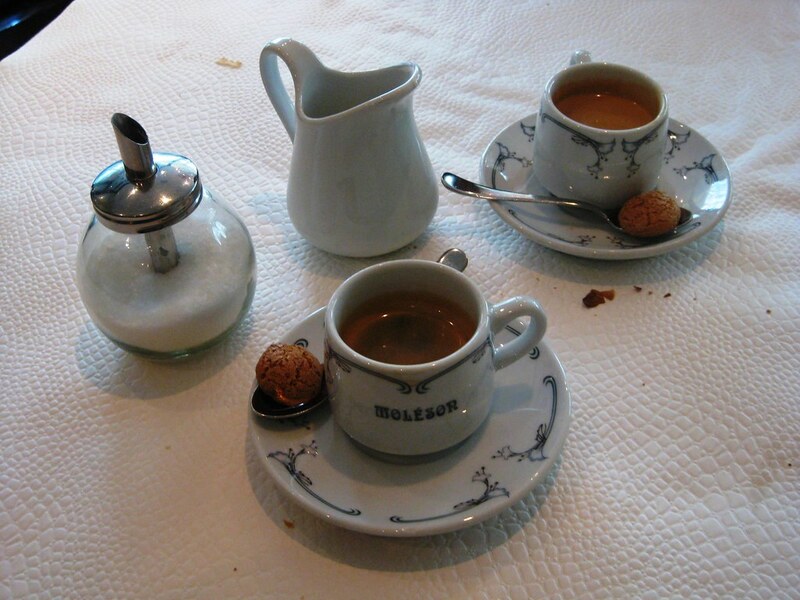 We had lunch at another great restaurant called Moléson. 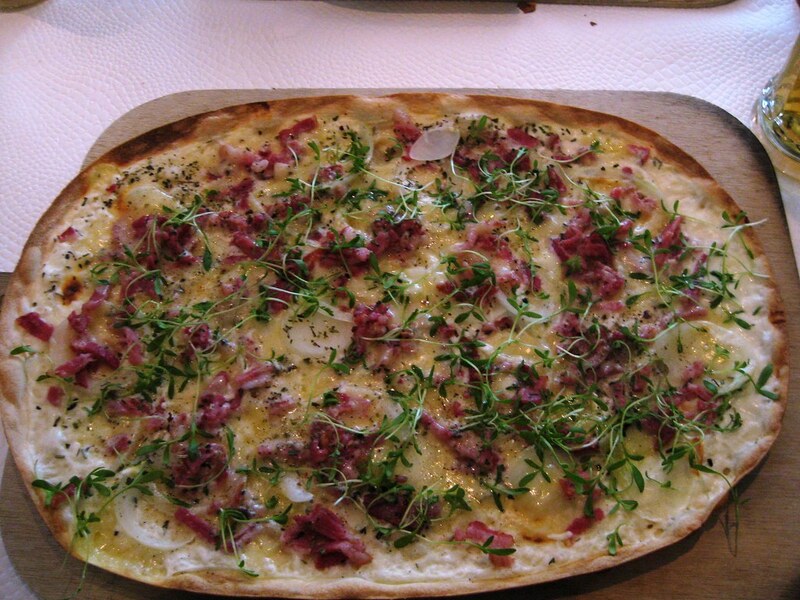 One of my favourite foods is tarte flambée, the Alsacian pizza-like dish. I like the traditional version with creme frasche, muenster cheese, bacon and onions; Moléson’s tarte flambée had a couple more ingredients, but was very tasty. The service could not have been better – they even let us substitute the traditional tarte flambée for the one on the daily special menu (a chicken-curry based model, maybe ala Wolfgang Puck’s spicy chicken pizza, but, to me a bit of a travesty …). We had a wonderful salad to start and coffee was served just right. The restaurant in the back looked excellent too (we ate in the front cafe). They also try to use local ingredients and organic food.